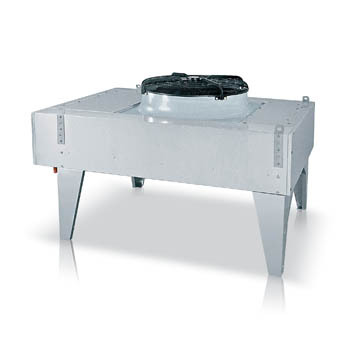 Remote condensers with axial-type fan(s) for outdoor installation. Installation may be vertical with a horizontal air outflow or, using special brackets, horizontal with an upward air outflow. The EC motor fans with very low noise and adjustable-speed fans are excellent for use in both technological and civil applications. i-BRE units operate with a single-phase 230/1/50 and 400/3/50 (only for BRE190b) power supply totally independent and separate from the indoor unit ACCURATE. These condensing units are therefore also suited for use without being directly connected to indoor units. i-BRE units are not provided with integrated fans speed regulator per standard. However, CLIMAVENETA can provide such fans speed regulator as OPTIONAL, by installing it directly inside the indoor unit ACCURATE.